Buyogan is a cultural feast that is celebrated annually in the month of August. The word “buyog” refers to a bee in which the town of Abuyog, Leyte got its name. Abuyog is the home of the famous Buyogan Festival that brings pride to the Leyteños for winning street contests in various events that was held during the Aliwan Festival in Manila and Sinulog Festival in Cebu. Buyogan Festival is one of the highlights in a long-week celebration in honor of St. Francis Xavier. The name of the town “Abuyog” originated at the time when the Spaniards landed at the shores of a river. When they saw the shore, they noticed a swarm of bees. The Spaniards then asked about the name of the place but the natives thought that they were asking about the name of those flying insects, so they answered “buyog”. The Spaniards repeated what they said, “Ah! Buyog”. And that is why the town is now called Abuyog. According to an old legend, Abuyog has a mystical creature known as Opayda. It is said that Opayda is a good fairy who guides the fishermen back to the shore using her magical voice and that she helped cure victims of bee stings. Buyogan Festival is one of the best festivals of the Philippines. It showcases an artistic choreography that represents the various sizes, shapes and colors of bees. 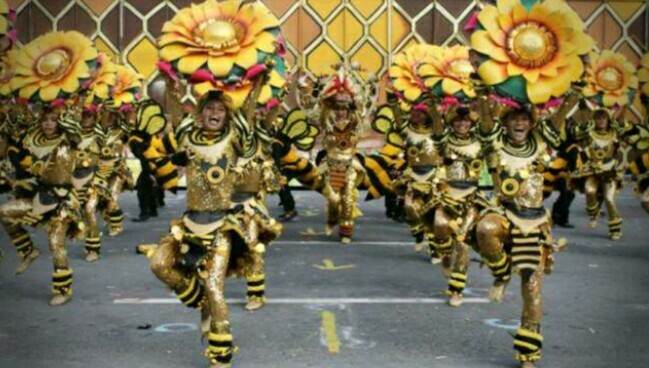 Performers are dress in a bee costumes while some of the locals who watch the performances have their faces and bodies being painted with tribal tattoos that represent the ethnic history and rich culture of Abuyog, Leyte. The street dancing parade happens around the coastal town of Abuyog. Children also participate in the said event as little bees buzzing around in a reproduction of a beehive. The bee-inspired festival earned its fame when the Abuyog Tribe joined the Aliwan Festival and managed to win as the grand champion. In the first Leyte Kasadyaan Festival in October 1996, Buyogan was the champion and was declared as Hall of Famer for winning as champion for five times since that year. As Hall of Famer, they were not allowed to compete for the next competition as being the winner for many years. And when it made a comeback in the year 2007, the well-loved Buyogan Festival won again in the Pintados-Kasadyaan held in Tacloban City. Have fun and be entertained by the vibrant bees at the Buyogan Festival of Abuyog and witness their award-winning performances. Abuyog is the largest town in the island of Leyte in terms of land area. It is a municipality facing Leyte Gulf out into the Pacific Ocean. For travelers originating from Tacloban City, you can ride a vehicle to the bus terminal. From there, you can take a bus or van that are labeled “Abuyog”. Van fare is Php65 and bus fare is Php50 per head. The end point will be in the Abuyog Terminal located in Barangay Tab-ok.